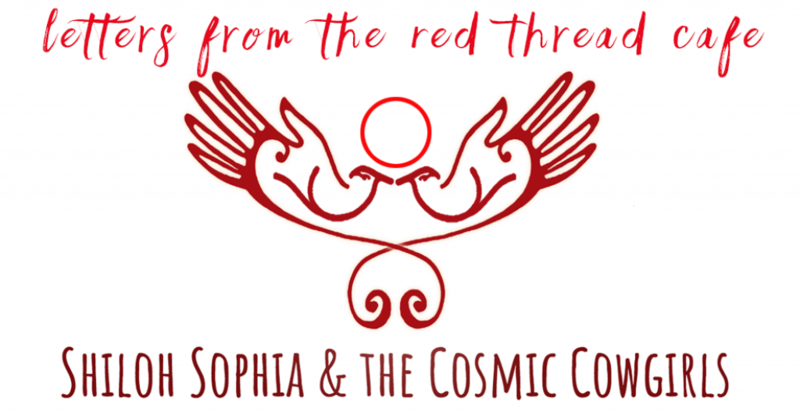 This Red Thread Letter shares my thoughts about this topic, drawn from 25 years of working with women and children in the domain of creativity. My intention in sharing it is to provide a context for ‘viewing’ recovery through the awareness of how abuse impacts psychic, spiritual, and physical structures. I created these images to accompany this writing exploring these ideas. our natural patterns are interrupted. can become dented and fragmented. We are not as we were before. we are different than we were before. the shape of a being? are there in our energetic patterns. and be informed about and by. aspects of being are communicating. between systems are often interrupted. The internal narrator turns fierce. ourselves somewhere along the way. fractures and spreads throughout our entire being. or capacity to influence at the time. or right after, or even years later. our potentials appear limited, wing clipped. enter and impact the architecture of our psyche. coding stories into impressionable cells. to catalyze the wound, but how. trauma makes it physical to the body and the field. and so much more than we know. of gravity for this earth experience. changes how we are living in these structures. Structures meaning both physical and energetic. the seemingly separate pieces of healing. the braid ourselves, and often, we do. the course to THIS MOMENT. 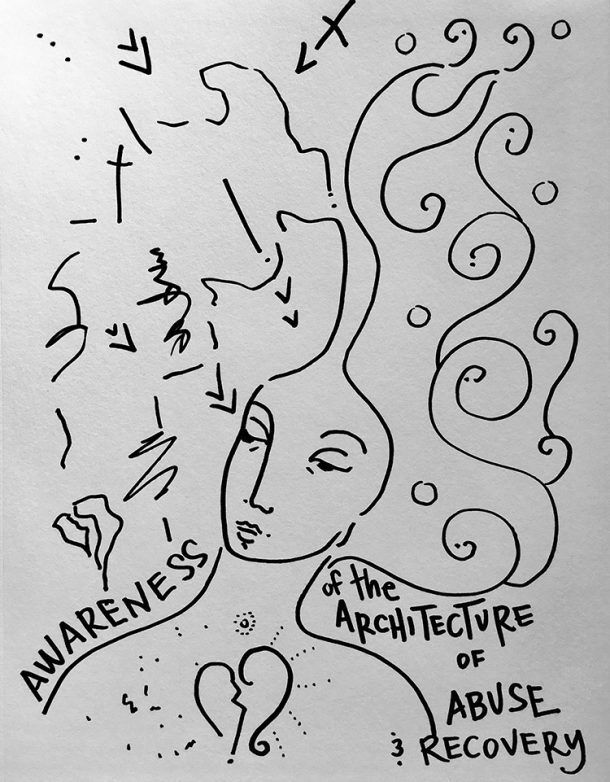 of the awareness of the architecture. put in place, to return to and nurture? awareness of the design of human being? How do we even talk about it? The design you are, is personal to you. of one story supporting another. healed enough? Is that a closer view? seem abstract and perhaps even woo woo. the next level of authoring your healing. what this looks like for you. YOU are the one who heals you. it can be challenging to SEE IT. and is waiting for your awareness. engage with your psychic architecture. often hidden domains of being. about curating your own consciousness. to repair the vessel, with our own hands. By hands, I do mean, HANDS. to reshape how you are living within your being. for healing to begin to happen across all levels. This is very real, biophotons are lighting you up. even if you are stretching to grasp. Reach . . . .
informed by a willingness to be in inquiry. and place we haven’t been before. rooms of self, gets stirred. 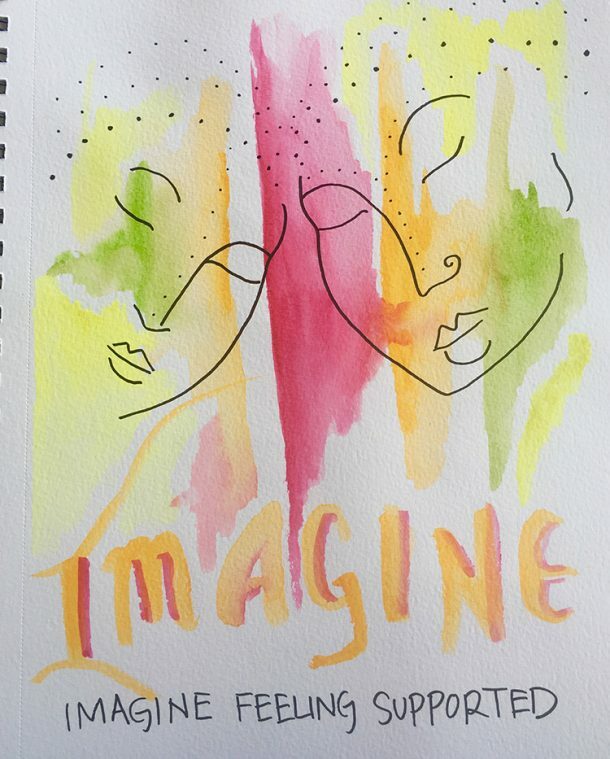 As a community we’ve been working with over 1400 women the past 4 weeks on a process to experience self expression and begin to heal hidden stories. I am a poet, artist, and I hope, a guide along the path of healing. This is not a textbook teaching or a truth. 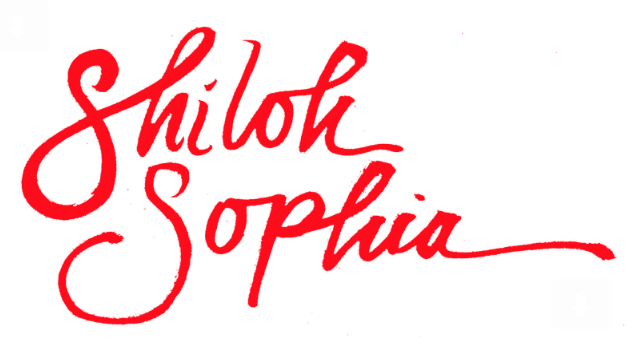 This is my own experience and drawn from 25 years of working with women and children in the domain of creativity. My intention in sharing it is to provide a context for ‘viewing’ recovery through the awareness of how abuse impacts psychic, spiritual, and physical structures. I hold the possibility that the infiniteness of soul, somehow, remains whole and holy through all of it, guiding us ever onward to reclaiming our identity as we move on through the slings and arrows of human existence at this time. That said, if we can make contact with that soul space our communication can be more direct, and perhaps the stewarding of our recovery less random. I am aware that in many cases the scars are quite visible. I am speaking in this context, primarily of what happens when the ‘visible’ impacts are hidden. And how that which is seemingly hidden from view impacts us. Yet the wound remains as large and real for us as if it is an open wound. It can be difficult, when we, and others, cannot see it – really ‘see it.’ We often question our own experience of it. Perhaps you have had this experience? Did it really happen? I am using poetic linguistic frames – concepts that help us speak about things that are often either too abstract or intellectual to grasp in common dialogue. The articulation of which allows us to look at certain aspects as separate in order to bring them back together. By psyche I mean the entire whole and consciousness of the being. By identity I mean the whole being, including the unique animating personality. Yes connected with ancestry, but more than that as well. By architecture I mean the energetic and physical frames that hold the whole of us in place, in space. By soul I mean, the being that is infinite, in the mystery, that is you beyond this space and place. Whatever that is, we don’t really know . . . but to explore soul we begin to think about what the soul is for us. I simplify here in an effort to create inquiry around things that are often difficult to talk about. Make suggestions if you choose, and forgive me my errors. I will correct them as we learn more, together. At one point in my life, I was so hurt. I was in shock for a few years and witnessing the invisible wound that would not heal over. Through ‘watching’ it as the observer, as well as choosing to see the self I knew I was, the healing began. I painted the resolution. I made the marks, so many marks, tears and rips, acknowledging my damaged architecture while holding the awareness of who I held myself out to be. I saw my mind as a tree of life, with some damaged branches that would bloom one day, if I tended my tree. As I worked through the creativity, more of how it worked from a science and brain perspective came through. Being able to ‘see’ it on the canvas allowed me to remove the arrows at first one by one and then all at once. 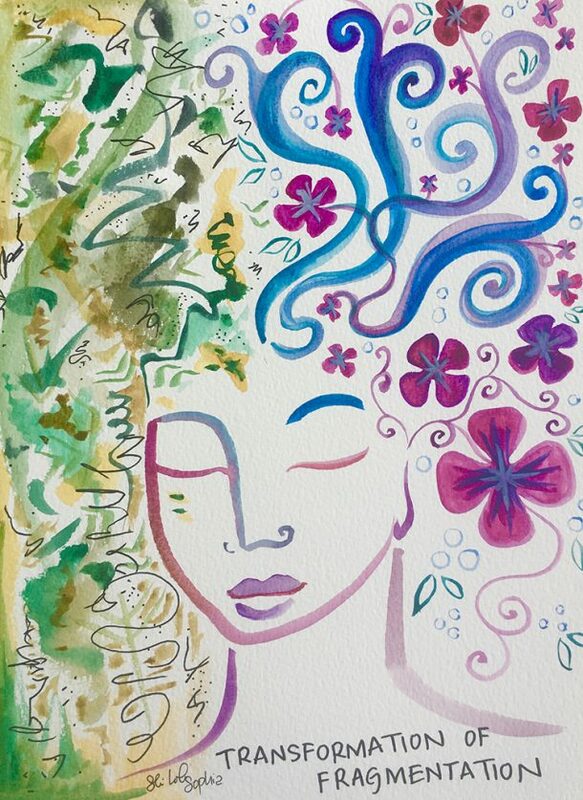 Between writing and painting, I was able to become ‘current’ with my state of being – psychic, spiritual, and physical – and be present with where I was. It isn’t that the scars aren’t still there; instead, they have become colorful, then moved into the background. To be summoned by choice instead of continually triggered without warning. My resiliency toolbox is filled with Intentional Creativity and overflowing enough to share it with others. Amen to that. Healing does take time, no matter how present we are. Yes, it was years for some parts, but others healed as soon as I was able to turn my attention towards them in a painting process. My story needed me to see it, not just conceptually but contextually as a part of the whole being that I am. 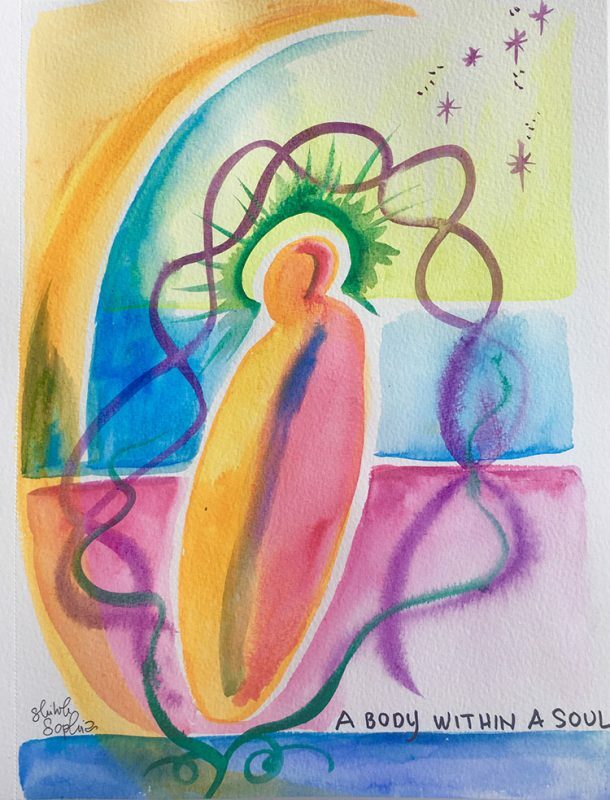 The roots of this work are precisely what informed Color of Woman, our Intentional Creativity Teacher Training, a calling to share with others what I had discovered. In my recovery, there were moments I felt I wouldn’t have to kill myself; I would merely expire from the pain of beauty and innocence lost. 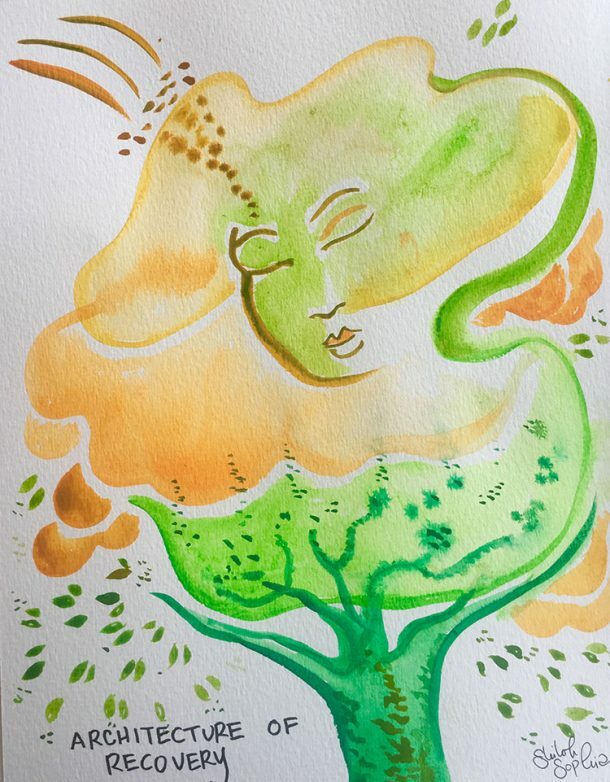 The ‘tree of my consciousness’ was informed by an image from my teacher, Sue Hoya Sellars, in which I ‘saw’ the tree as my mind and I had to heal each branch. First, I named the parts of me that hurt, then the wholeness image began to do the work without a need to articulate every offense. I just had to get myself started, and then the momentum took over. 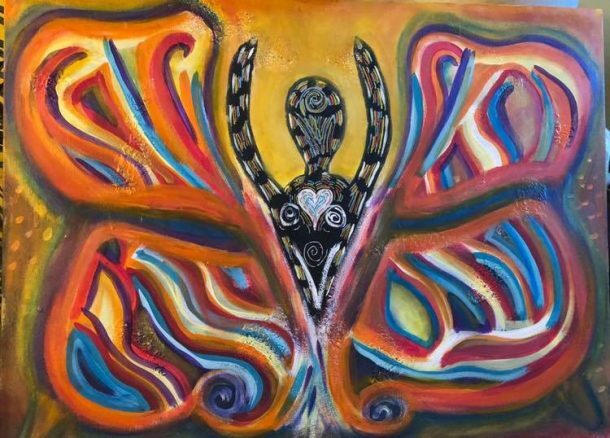 Informed by my mother’s study of the Tree of Life teachings, I ‘knew’ I could lean into the ‘tree of my consciousness’ for support, connected to the earth. I painted and painted. Healing through seeing and being. 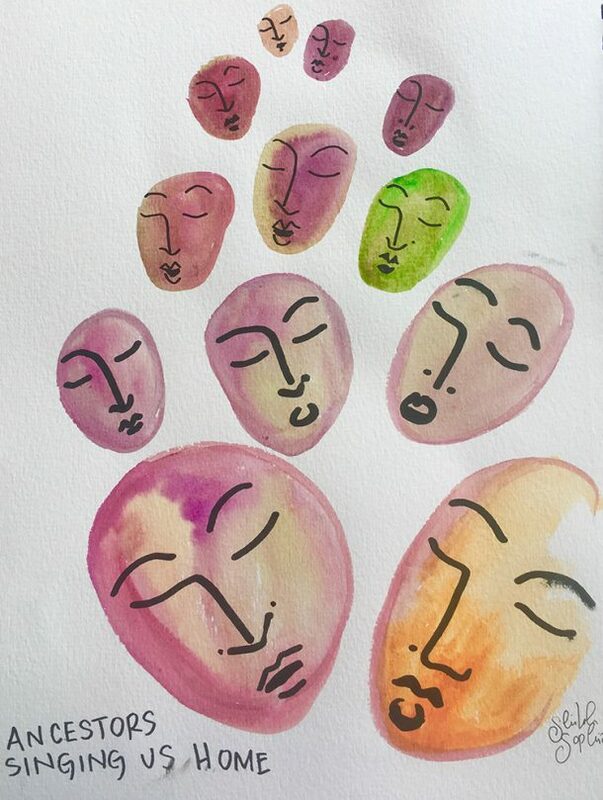 My work with art-making as a form of healing resides in both ‘seeing’ and experience of it through physical ‘being.’ In Intentional Creativity, the shifts happen in the psychic, spiritual, and physical architectures all at once, hence, the capacity for it to be so inclusive, and in some cases, quick too. When we are ready for the next layer of healing, whatever in us that is ready can move (energetically and more) through the act of creating. 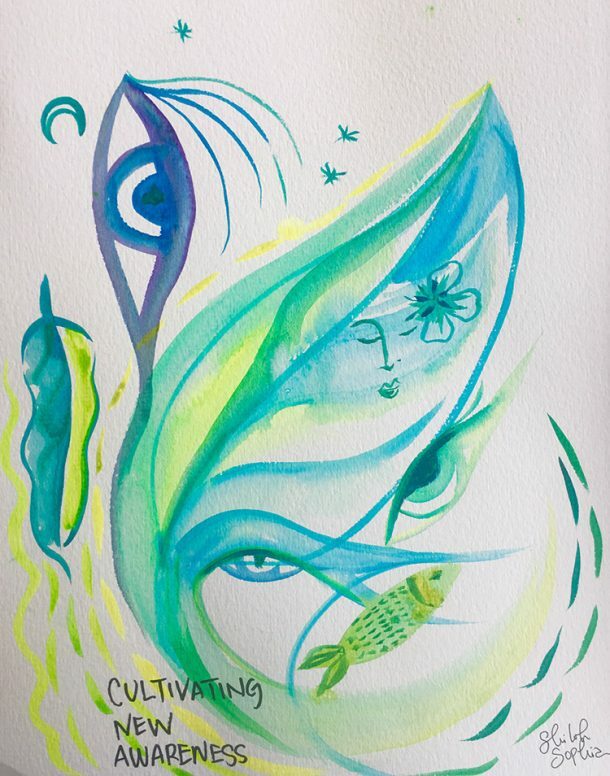 Creating engages the whole self, and so a focused intent on healing with the action of creativity offers a chance at a new level of awareness about how this all works. When we are whole and mostly unhurt, our ‘architecture’ is intact and makes specific shapes in our field, body, blood, bone, personae, mind – all the parts that make us up that are visible and invisible. I say, mostly unhurt because many believe just being born can be traumatic. When we are hurt, the patterns of beauty are interrupted. Our entire being it seems can be dimpled or fragmented or dented. It still knows the original shape of wholeness that connects with our personae, our identity. In Cosmic Cowgirls, the reason we begin with the Legendary Self is to forge the powerful connection with the one who tells the story through activating imagination and animating the one within. Legend emerged WHILE I was going through my recovery, and I might say, saved my life through creating a visionary likeness of myself that I held out – as an image of recovery – and an image of self-celebration. 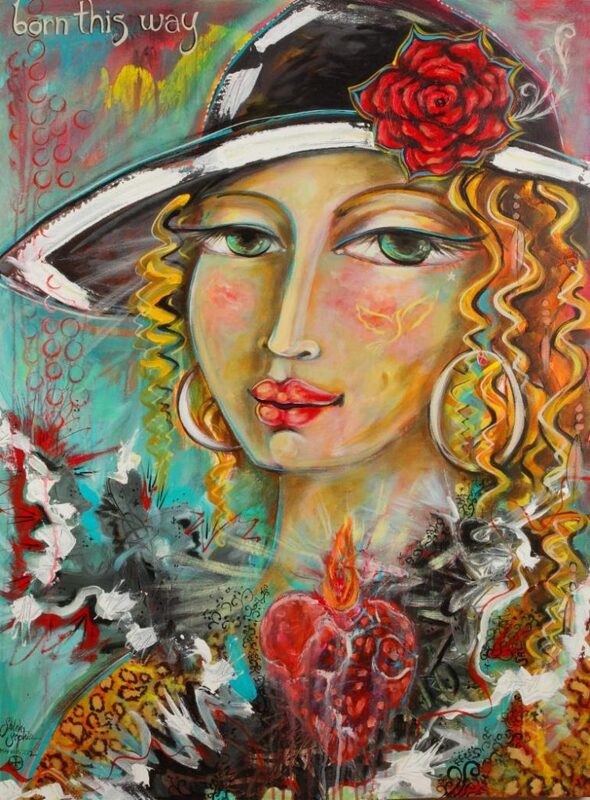 Something to reach towards – yes, with a hat with a rose, and a leopard boa and attitude in my eyelashes (painting: Born This Way). Our lineage of Intentional Creativity has stories of supporting and mentoring, and of passing on the wisdom we have gained. I hope this has moved you, uplifting the experience of a supportive community, a visible and invisible, architecture of loving. As we close this cycle for the Colorful Scars experience, I wish to thank each of you for your willingness to risk the work of recovery in a new way. I am so grateful, more than I can ever tell you, for all the stories you have recounted and the acknowledgment that it has, indeed, helped you along your way. Let us continue to gather together in red thread. Protecting those we can, by becoming protectors, and knowing, we too are surrounded by loving others who have done the work before us. Holding love and support for those impacted by the fires. For now we are safe. Thank you to those who reached out. Here is a link to an IC process for use during natural disaster recovery. 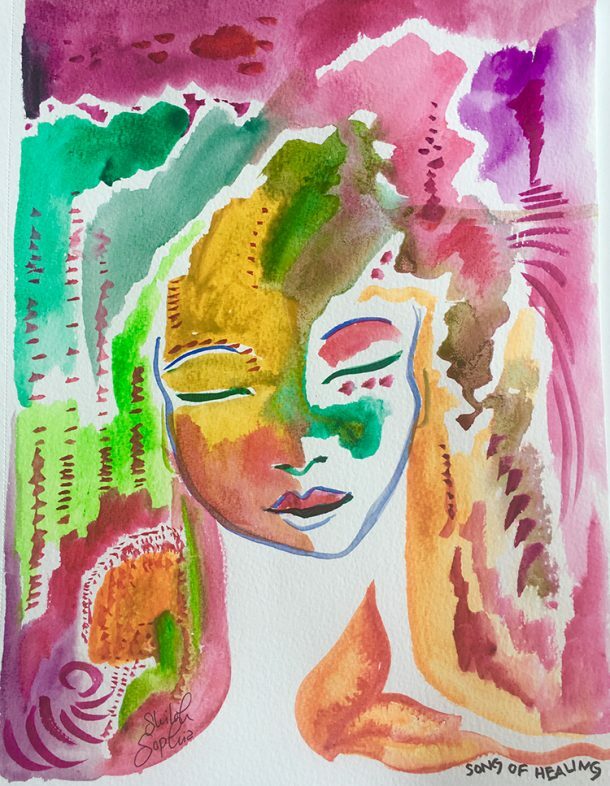 Colorful Scars ~ a free class for women to experience self expression and begin to heal hidden stories.